Ip Man as imagined by Wong Kar Wai. Welcome to the November edition of “Chinese Martial Arts in the News.” This is part of a regular series of posts that present us with an opportunity to discuss recent developments in the news and popular culture. If you know of a developing story that you would like to see covered, drop me a note in the comments or send an email. Chinese Martial Arts in the Media: Ip Man gets Two New Movies and the UFC goes to China. 1. Wong Kar Wai’s “Grandmaster” (Finally) has a Release Date and Trailer. I will admit it. After years of waiting I didn’t think it was actually going to happen. I really like Wong Kar Wai’s work, but I was sure that his “artistic sensibilities” had consumed this project. Turns out I was wrong. His long awaited Ip Man bio-pic is finished and will be released (in China) on December 18th. I am not sure how long it will be until a decent cut of this film makes it to North America, but I will be waiting. To help pass the time we have been given a fairly comprehensive trailer. Its hard to tell exactly what is going on with this story, which is deeply ironic if you have written as much about Ip Man’s life as I have. Basically this appears to cover the same years as the Wilson Ip film. Needless to say Wong is a very different director and I am sure that he will be taking the Grandmaster’s life in a new and creative direction. Which is fine. It is not really rational to expect historical accuracy in Kung Fu films. Still, there is an awful lot of snow in that trailer….and Ip Man did spend his entire life in a tropical environment….. But wait, there is more! Emperor Motion Pictures is set to start production on yet another Ip Man bio-pic. It sounds like the project is still in its early stages but they have selected a director. Herman Yau is set to direct the project which is tentatively titled “Ip Man-The Last Fight.” You can read more about this project at the Hollywood Reporter. If my count is correct, this is the 1,574th Ip Man film to come out this decade. I liked Wilson Ip’s original film, and I look forward to seeing what Wong Kar Wai can do with his project. Still, how can so many films present highly fictionalized accounts of Ip Man’s early life but none be willing to tackle the actual drama of his Hong Kong years? Maybe Herman Yau will change that. 2. Cung Le’s Knockout Dominates the UFC in Macau. As I mentioned in the last news-update, the corporate entity behind the Ultimate Fighting Championship (UFC) has been seeking for a way to break into China’s domestic media market. So far only the NBA has had real success selling itself to the Chinese people, but the UFC hopes to succeed where a lot of other leagues have failed. After all, China already has a long tradition of combat sports and Sanda (a form of kickboxing that is part of the official government sanctioned Wushu program) is quite popular. Of course UFC matches are just like any other sport. People root for the home town team (or fighter) and China just doesn’t have very many at the moment. This is a challenge and it has slowed the spread of MMA in mainland China. However, after the highly publicized event in Macau that dynamic might be about to change. While there was a Chinese fighter in one of the evening’s earlier events, the spotlight was on Cung Le. This Vietnamese-American fighter is one of the few individuals that has been able to spark enthusiasm in China. While most MMA fighters are dedicated followers of grappling arts like Brazilian Jujitsu, Cung Le studies Sanda, a Chinese discipline. He is a smart fighter with powerful kicks. His fights tend to be exciting and his record provides ample proof that a “striker” can win fights in the UFC. Which is exactly what he did, in spectacular fashion, in Macau. He KO’ed his opponent with a beautifully timed and precise punch in the first round. The crowd went nuts, and MMA took a big step closer to acceptance in the Chinese market. Check out the footage of this fight here. 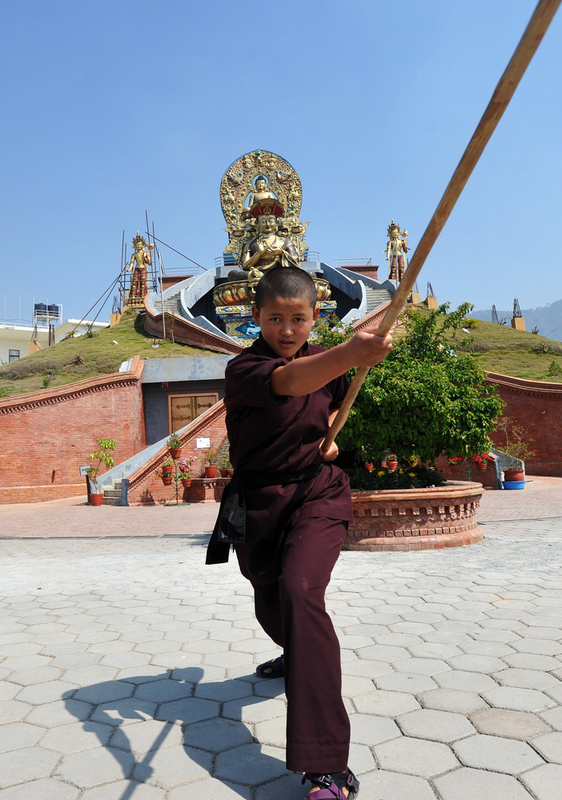 A “Kung Fu” nun demonstrates a pole form at a Tibetan Temple in Nepal. Nuns from this order recently traveled to CERN in Switzerland where they displayed their skills and discussed “energy” with a set of confused particle physicists. Shaolin Disneyland vs. the “Kung Fu Nuns”: Monastic Violence gets Surreal. 1. Meet the “Kung Fu” Nuns of Nepal. I noticed that a number of science blogs had been reporting this story in the last week, but this is the first article I have seen aimed at a more mainstream audience. It seems that an order of Tibetan nuns in Nepal has taken up Kung Fu. Their style claims to be a mix of various Shaolin and Vietnamese arts that was previously developed by a group of Vietnamese nuns in 1992. The back-story to all of this is fascinating. Its a classic example of why individuals adopt the martial arts (for personal empowerment) and how they explain their practice (“yeah, we developed our style in 1992, but it is also what “ancient Vietnamese generals” have been doing for thousands of years…..”). As an added bonus the article above features some interviews with well known martial studies scholars. These Nepalese nuns recently sent a demonstration team to CERN, the home of the Large Hadron Collider. Their display was one part of a series of conferences on theology, spirituality and science that have been hosted at CERN. The nuns demonstrated their art and someone from their religious order discussed subtle cosmic energies, Qi, and how “female” and “male” energies differ. I have not heard anything on the reaction of the CERN physicist, but I suspect that this might not have gone down all that well. In China there has been a certain amount of state sponsored research attempting to explain the existence of “Qi energy” through physics. Needless to say, this same approach (and ontological openness) is not accepted in western scientific circles. You really have to wonder what sorts of exchange is actually possible when you just toss individuals with such different views of reality into the same room and lock the door. 2. 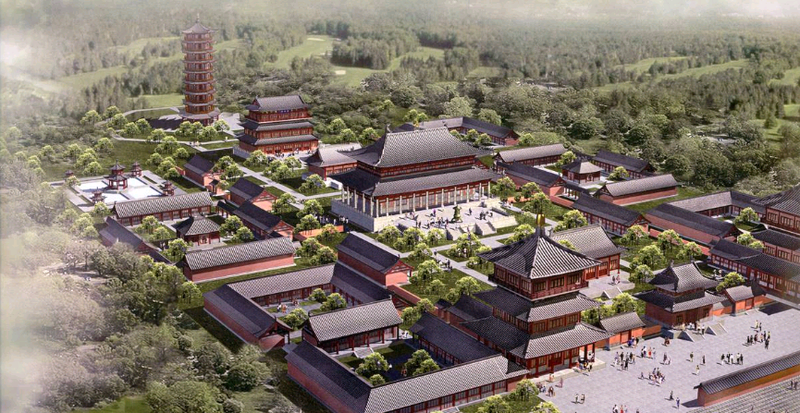 A New Shaolin Temple Complex to be Built in Illawarra (New South Wales) Australia. The Shaolin Temple in Henan has decided to expand and, interestingly enough, they have decided that the “Gold Coast” of New South Wales is just the place to do it. Their plan is still in the early stages, but they are overcoming the various bureaucratic hurdles that accompany any sort of endeavor of this scale. And what sort of “scale” is Shaolin going to build on? A small retreat for local students of Chan Buddhism and a handful of martial artists perhaps? Nope, they decided to go big. Really big. An artist rendering of one part of the new “temple complex” currently scheduled for construction in New South Wales. This is an artist’s rendition of one section of the proposed temple. The entire complex is massive and will include a completely functional temple, a monastery, classroom space for martial artists and religious students, stages and performance areas, a massive luxury hotel, and yes, that is a world class golf resort you see in the distance. Because we all know that golf is one of the traditional hallmarks of Chan Buddhism….. In reality the “temple” is expected to function almost solely as a tourist attraction. Tourism has been an important part of the regional economy, but recently the industry has struggled. Local political leaders jumped at the chance to host a massive attraction. They have promised that the “temple” will create large number of local jobs and will be a bonanza for the economy. Many residents remain skeptical of these economic claims and the environmental impact of this project. This article has some good background information on the project and the major players. For years there have been charges that Shaolin has become “overly commercialized.” I have tended to give the temple and its scandal prone abbot, Shi Yongxin, the benefit of the doubt. After all, Shaolin plays a fantastically important role in Chinese popular culture. It is hard to imagine that some place that popular would not be mobbed with tourists. Of course everything at Shaolin is noisy and expensive, its not like the monks want to be surrounded by tourists…..Its not like they would actively seek out that kind of worldly attention….. This latest project is just jaw-droppingly audacious. There is no way to read the proposal and spin this as anything other than a crass commercial venture. Maybe this is the sort of thing that is making the Chinese government a little uncomfortable? Which is not to imply that the Chinese government has a stellar record when it comes to business ethics and local economic development (note the martial arts angle here). Do not forget about Kung Fu Tea’s Facebook page. In the last few weeks I have posted a number of shorter videos and thoughts that readers may find interesting. This page is a great way to keep track of what is going on at Kung Fu Tea. Lastly, I will only be posting on Monday and Wednesday this week due to the holiday. Stay safe on the roads and have a great Thanksgiving! I am glad you liked it and thanks for dropping by. I just added you to the “people to know” section of the “Chinese Martial Studies Resources” tab. Let me know if I described your research interests correctly.